One of the bakeries where I grew up baked the best little olive rolls: small, with a chewy crust and the fluffiest softest bread inside, flecked with salty olives. 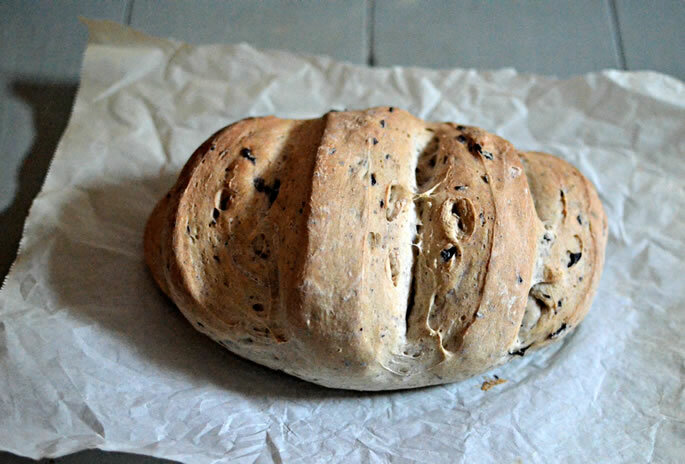 I haven't managed to replicate those, but this bread has come closest to scratching the itch. 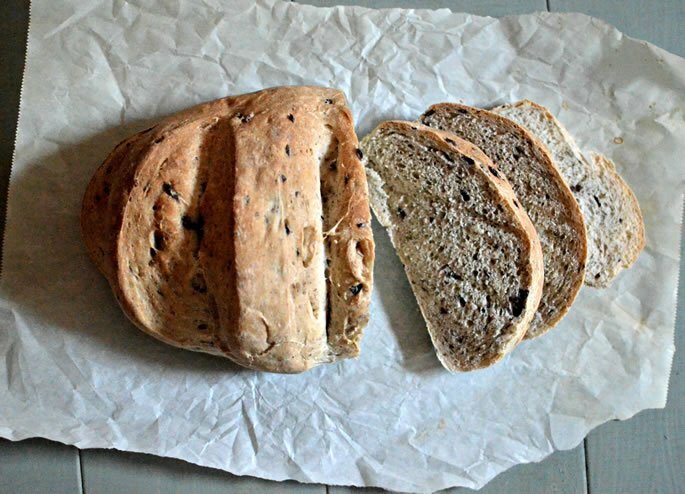 You can halve the recipe if you only want one loaf, but once I'm already going to the effort of baking bread I prefer to make two, especially since it freezes so well. Pour half the warm water into a bowl and sprinkle the yeast and sugar over it. Leave for 5-10 minutes until the yeast looks thick and frothy. Add the remaining ingredients except the olives. Mix (by hand or in a stand-mixer) until the dough comes together. 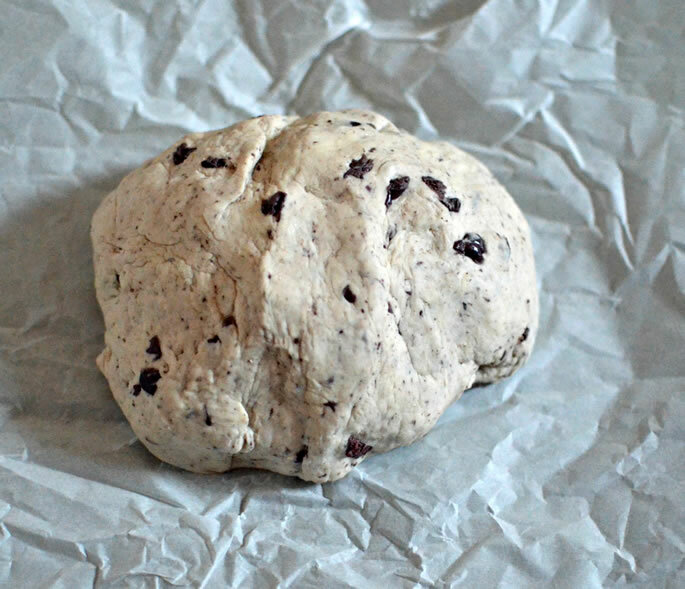 Fold in the olives and knead for 10-15 minutes (if using a machine, you can cut it down to 5-10 minutes). 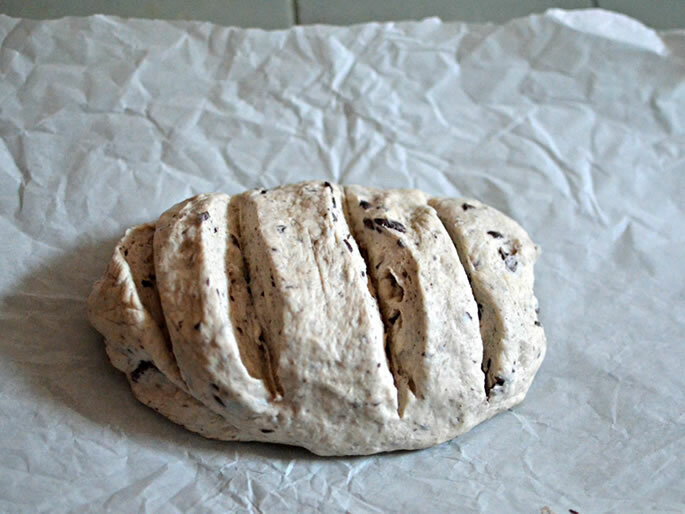 Place dough in a greased bowl and cover with clingfilm or a damp towel. Allow the dough to rise in a warm place for 1 hour. Tip the dough out and punch down (ie. let it deflate). Divide the dough into two equal sized pieces and shape each one into an oval. 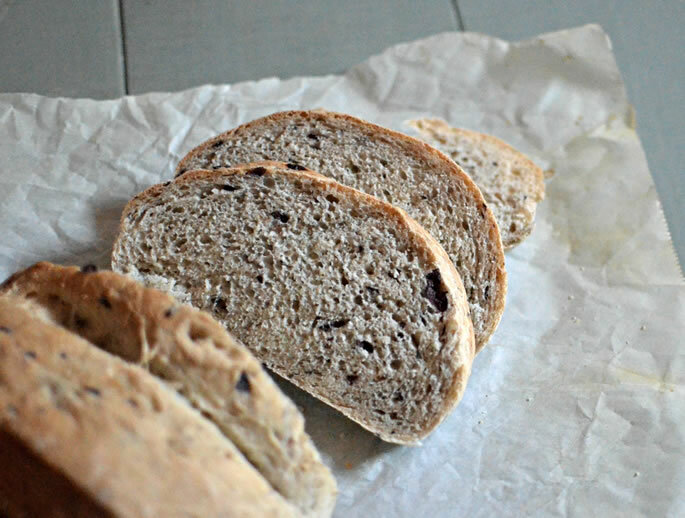 Place the loaves on a baking sheet lined with parchment paper and set aside to rise for another hour. Heat the oven to 400°F and place an empty baking dish on the bottom rack. Use a serrated knife to cut 2-3 shallow slits in the top of each loaf and slide the pan into the oven. Carefully pull out the bottom rack just enough so that you can pour a cup of water onto the empty pan. Quickly close the oven and bake for 30 minutes. Transfer the bread to a wire cooling rack and only slice once fully cooled. Freezes well. Miriam Szokovski is the author of the historical novel Exiled Down Under, and a member of the Chabad.org editorial team. She shares her love of cooking, baking and food photography on Chabad.org’s food blog, Cook It Kosher. © Copyright, all rights reserved. The content on this page is provided by our content partner, Chabad.org. If you enjoyed this article, we encourage you to distribute it further, provided that you comply with Chabad.org's copyright policy. I would like to receive news and updates from Chabad-Lubavitch of Nebraska by email. Travelling? Find a center anywhere you go.